The contest for Burney Basin Days Queen is one of the major events of Burney Basin Days. 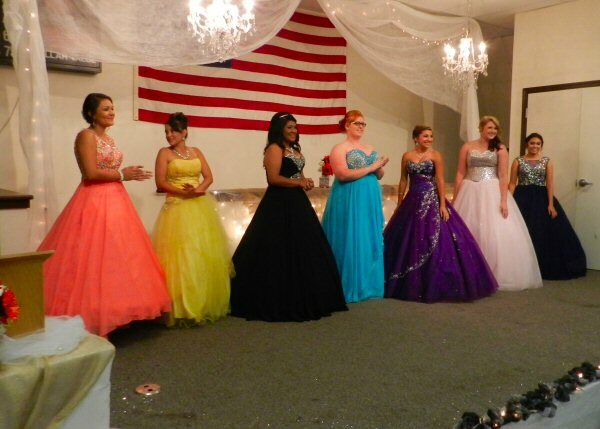 At the 2015 Queen Pageant held on July 2nd, the VFW hall was packed as seven charming young ladies competed. Each contestant gave a speech, answered questions presented by the judges, and modeled in causal, summer, and formal dress. Every contestant won a title. Monica Blanco won Miss Personality; Autumn Boyle, Miss Congeniality; and Beverly Vaughn, Miss Photogenic. Gabriella Chacon was crowned Third Princess; Caiya McCloud, Second Princess; and Faith Scalf, First Princess. The 2015 Queen of Burney Basin Days is Crystal Flores, a student at Burney High School. Here are videos of 2015 Miss Personality Monica Blanco as she gives her speech and answers questions from the judges.